California-born drummer Chad Wackerman needs no introduction for fans of jazz-rock/fusion. After his 7-year stint with Frank Zappa in the Eighties – started when he was barely 20 years old – he embarked on a successful career as a session player. He also toured with such diverse artists as his former Zappa bandmate Steve Vai, former Police guitarist Andy Summers and famed singer-songwriter James Taylor. He is also known to fusion fans for his long-standing collaboration with Allan Holdsworth, which continues on Wackerman’s fifth solo release, titled Dreams, Nightmares and Improvisations. As the title implies, Dreams, Nightmares and Improvisations presents a collection of musical sketches that may initially come across as quite similar to each other, though subtle differences will unfold at each successive listen. With a dream team of musicians on board – including, besides Holdsworth, two veterans of the jazz-rock scene such as keyboardist Jim Cox and bassist Jimmy Johnson – the album’s 14 tracks showcase the artists’ individual skills while maintaining a sense of cohesion. The smooth, effortless dynamics within the group reveals the ease born of a long familiarity with each other’s styles and quirks, almost uncanny in the light of the largely improvised nature of the music. All of the tracks possess a laid-back, slightly loose quality, which is particularly true of the shorter numbers in the second half of the album. While Wackerman’s state-of-the-art drumming is often placed in the spotlight (more prominently than on the average jazz-fusion album, where the drumming tends to be somewhat understated), it does not overwhelm the other instruments. Jimmy Johnson’s equally dazzling bass lines often emerge in sudden bursts of sound, while Jim Cox’s majestic keyboard washes, supported by Holdsworth’s signature SynthAxe with its atmospheric, somewhat faraway sound, round out the whole. The tinkling percussion and surging keyboards of opener “Glass Lullaby” immediately introduce an ambient note (later reinforced by pieces such as the aptly-titled “The Billows” and “Waterways); indeed, as a whole the album tends towards a slow, meditative atmosphere rather than the sleek dynamics of more tightly structured instances of the jazz-fusion genre. In “A New Day” – at almost 7 minutes the longest number on the album – the lazy, almost meandering SynthAxe and crashing cymbals suggest the steady movement of a waterfall; while the 6-minute “The Fifth” starts out briskly, then slows down towards the end, with the guitar stepping up in elegantly unhurried fashion. The two funky numbers towards the end at the album, “Brain Funk” and “Two for Ya”, sound vaguely out of place in the context of the album, and the slightly dissonant, distorted sound of the SynthAxe may feel somewhat grating. On the other hand, the short drum solo of “Rapid Eye Movement” offers a display of Wackerman’s skills without the pointless pyrotechnics usually associated with such items. With brilliant performances all around, Dreams, Nightmares and Improvisations is highly recommended to jazz-fusion fans (and obviously drummers), though its impact may not necessarily be immediate. Listeners may also find that it works much more effectively if taken as a whole rather than as a collection of separate tracks. All in all, the album is a classy offering that can be appreciated by anyone who loves music performed with the right balance of skill and emotion. You’re right on the money, as usual, Raffaella! After Holdsworth’s disappearance from the music scene, this was a refreshing reemergence. 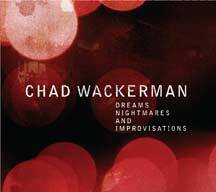 Full of unpredictable moments, “Dreams” is a really different outing for Chad Wackerman. Indeed, as you indicated, there is a genuine “looseness” (though certainly retaining cohesion) about both the material and the performances that add up to a wonderfully refreshing album. Being familiar with his previous solo output, this comes across as much less rehearsed and charted out … more about the magic of the moment being captured in a variety of different musical settings, as musical sketches (and spontaneous improvs) are given room to breathe and the necessary space to pursue their destinations — wherever that may happen to be! Thanks for the post and great review … you remain one of progressive music’s best friends and strongest allies. I hope everything is going well for you. You know what my capacities are … if I can ever assist you, please don’t hesitate to ask! Thank you so much for the kind words, John! This is why I still keep doing this, even if sometimes my motivation flags badly – often because of outside circumstances.